At the time, many authorities were inclining strongly towards a recombination of the 3 genera Rebutia, Aylostera and Sulcorebutia under the original name Rebutia, and relegating Aylostera and Sulcorebutia to the rank of sub-genera, or dropping them completely. The chapter "cultivation and propagation" is really very interesting. This book is no longer edited. You will have to try to find it as a second hand book. I bought mine from an English bookseller for 10 £ (about 15 €). 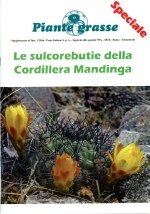 A 144 pages book written in english about Sulcorebutia and Weingartia. Illustrated with numerous photos : 285 black and white photos 104 colour photos. Without going into details the book provides a chapter « cultivation » quite extensive. 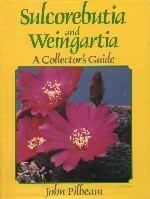 Much of the book is devoted to the description of the different species of Sulcorebutia and Weingartia. Unfortunately it is no longer edited. You'll have to find it on websites such as eBay or Amazon. I bought mine from Amazon UK as a second hand book at the price of 20 £ (about 30€). some lists of field-numbers (WR, FR, L, Kr, KK, V). This book is no longer edited. You will have to try to find it as a second hand book. I bought mine from a German bookseller for 22 €. A 180 pages book written in german very well illustrated with 159 colour photographs. I cannot really comment the text (even if I'm sure it is very interesting) as I don't speak german at all ! ! ! 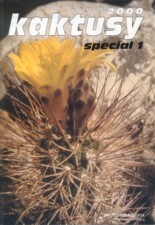 Nevertheless the Sulcorebutia's lovers will enjoy this book at least for the beauty of its photos. My copy comes from Uhlig, the famous German nursery. A 64 pages book written in english much more recent than the previous one. It shows 228 Sulcorebutias in colour photos. For each of them, the authors indicate the field number, the place where it was collected and add a small comment. It is a wonderful book with great photos and not very expensive (15 £ = about 23€). You can find it on John Pilbeam's website : click on the photo of the cover to go to his website. A 287 pages book very well illustrated with numerous coulour photographs. Geographical datas : species distribution maps + photos of different localities and their environment. 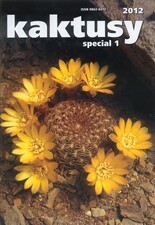 Species description with one or more photos for each one (in habitat or in cultivation). List of field-numbers of the author (LH) (6 pages). ± 67 pages in English with the species description without the photos. For each species, the author add some comments about the plant itself and/or about the habitat. - emergence of new species (christiei, confusa, veronikae), varieties or subspecies. - reappearance of older species (clizensis, glomerispina, tuberculato-chrysantha). I bought this book from an English bookseller for 25 £ (about 37,50 €). “In 1996, Hugo Philips and Johan Pot started the SulcoMania project. 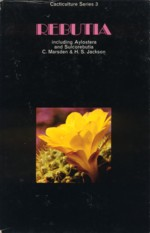 It focuses on the cactus genus Sulcorebutia. After the departure of Hugo Johan decided to continue the project alone. 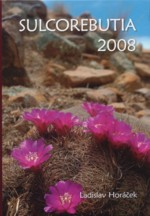 In 1999, Dr. Günter Hentzschel published a recognition key for sulcorebutias (Succulenta 78 (3) 1999, p.138). They would only be able to distinguish themselves from weingartia’s by the funiculi. However, this observation proved to be invalid, leaving no formal morphological differences between the genera. That is why classical weingartia’s and even Cintia have been included in SulcoMania, but no rebutia’s that can be clearly separated on the basis of their seeds. Though the name Weingartia is older than Sulcorebutia, the name of the project has not been changed. It is not always possible to distinguish a taxon morphologically from other taxa. SulcoMania is based on a fictitious average plant per taxon. If 75% of the individual plants studied are more similar to this average plant than all other plants in the project, the name is printed bold. The name is enclosed in quotation marks if there is little agreement with plants from the type locality or if no data have been collected. In the latter case, the choice of the discoverer of the population is often followed. This is a must have for all Sulcorebutia's (or Weingartia’s) enthusiasts. 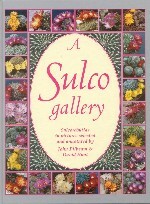 SulcoMania is published on DVD considering the number of photos (More than 13,000 - plants, flowers, seeds, seedlings). All the most recent descriptions are available ! SulcoMania is a huge database : each plant is illustrated with several colour photographs (on the field or in cultivation), described and located (map). For the searches, the plants are classified by field number or by name. Synonymies are also indicated. 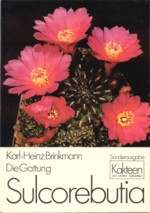 It is possible to morphologically compare two plants, generate cladograms… In fact, all you want to know about a specific Sulcorebutia can be found in this DVD. It's really a great great work and regulary updated. You can buy it from the author at the price of 50 € : j.pot@tip.nl (he speaks Dutch or English). Update : if you send back the cover of the previous version you'll only pay 10€ for the new version. Based on the same principle as SulcoMania, two other CD's are available : DigitoMania of Johan Pot (30 €) et LobiviaMania of Clazien Bouwman (30 €). Both of them can be ordered from Johan Pot. 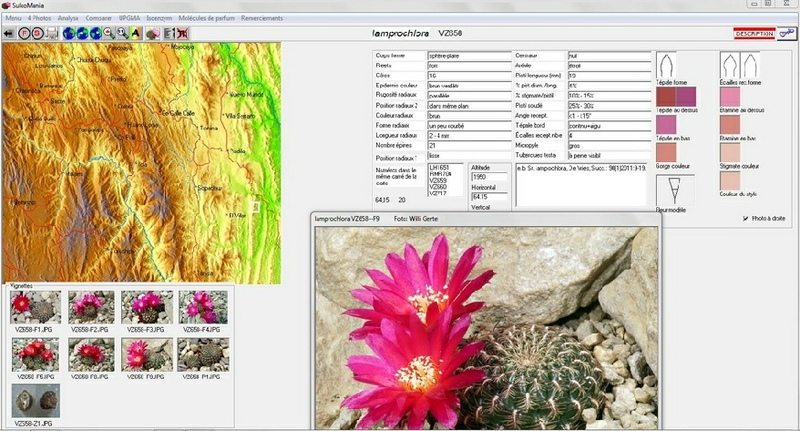 With CactusData you can compare 1700 different clones of Sulcorebutia and Weingartia. Johan Pot is well known in the world of collectors of Sulcos : his field numbers are identified by the letters "JK". This CD is very interesting because the author relates his Bolivia trips (7 until today). How to read the story ? 1°) You click on the text and you read the full story. 2°) Different maps can be displayed. You will see numbers on the map and if you click on those numbers a photo appears. Some of those photos will lead you to a text section explaining the photo. You can also display the JK field numbers in the maps (not only Sulcorebutias) and when you click on them a photo of the plant is displayed. The text is in Dutch, German and English. At the moment (in 2007) the complete story has not yet been translated in English (3 trips on 7). You can buy the CD from the author for a price of 20 € :j.pot@tip.nl (he speaks Dutch or English). indicates the similarity rate between those different clones. 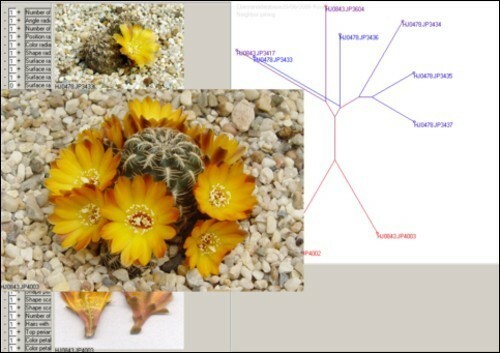 You can display a graph of the comparison (cladogram) and then the photos of the different clones and the flower section of those plants are shown (see the screen capture here above). This program is based on 48 criteria's (from the number of ribs and the pistil diameter to the colour of the central spine). When you compare several plants, clicking on the button "details" will display all data concerning those criteria's. You can buy it from the author at the price of 20 € : j.pot@tip.nl (he speaks Dutch or English). description of the plants of the « South group ». Once again, I cannot judge the text as I don’t speak German ! ! ! Unfortunately you cannot buy just that number : you must buy the full year ! 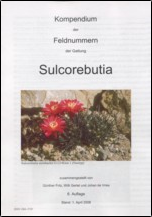 An indispensable book (in German) of impeccable quality for every Sulco enthusiast : 322 pages, 1358 colour photos (photos of the different sites and photos of numerous clones in habitat or in cultivation). This book is edited by the D.K.G. (Deutsche Kakteen Gesellschaft) and is unfortunately reserved for the members of that Society. The price of the book is only 12 € (shipping costs included) - the price of the membership to DKG is 35 € per year (the monthly journal “Kakteen und andere Sukkulenten” included). Growing Sulcorebutia in cultivation comparing conditions in habitat. This 123 pages book written in German is a compilation of field numbers (only Sulcorebutias) of some 51 collectors. 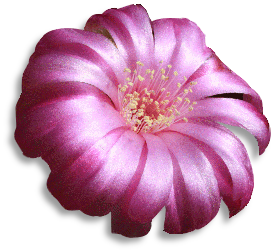 It is a quite interesting and useful database for all Sulcorebutia's lovers. It is frequently updated. With this 2011 version it is possible to buy an electronical version on CD in PDF format ( very easy and fast searches). The price of the 2011 version with its CD is 28 € (postage included). Special price for buyers of the 6th edition. You can order this book from Willi Gertel. Contact him by mail : Willi.Gertel@t-online.de (he speaks German and English). 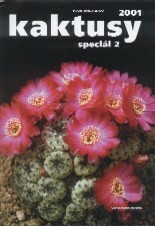 Special issue of the Czech journal Kaktusy (Kaktusy XLVIII - Special 2012/1) dealing with the genus Sulcorebutia. German text. Very numerous colour photos of plants and sites. I have bought it from the Swiss Cactus Association. Special issue distributed with the Italian journal Piante Grasse n° 1 - 2016 but available to non-members at the price of 20 €. This is a small book of 76 pages in Italian and English in which the authors explain some excursions in Bolivia. Many photos of landscapes and plants in the wild. A 129 pages book with lots of beautiful photos (two large photos by page) and little text. 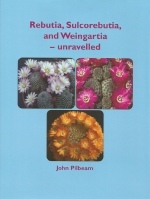 After The New Cactus Lexicon (2006) and the CITES Cactaceae Checklist 2016 in which just a few species of those three genera were recognized, John Pilbeam wanted with this book to show us many of those discarded names of Rebutias, Sulcorebutias and Weingartias and also many of the recently described Sulcorebutia species. I bought the book directly from John Pilbeam at the ELK meeting in Blankenberge (Belgium) at the price of 55 €. It is available on John Pilbeam’s web site.